This has been supplied by Andy Neve and Diane Bourne of Portsmouth Water Ltd and I want to offer my grateful thanks for their time and I hope that you find it of interest. Originally the Town of Gosport was the built-up and fortified part of the Parish of Alverstoke on the west shore of Portsmouth Harbour facing Old Portsmouth. In 1894 the Parish became the Gosport and Alverstoke Urban District, and in 1922 it was promoted to the status of the Borough of Gosport. Its fortunes have been closely linked with those of Portsmouth, because they have both depended for their .main livelihood upon the development over the years of H.M. Dockyard and its many subsidiary establishments in the district. Gosport is, in effect, the western division of the Port of Portsmouth. But although they are neighbours, the wide expanse of the Harbour between them caused their respective water supplies to be developed quite independently of each other. Evidence of this supply in the then Middle Street (now High Street) has been provided by the wooden pipes that have been dug up from time to time along this roadway. The next known reference to an early public water supply is found in The Times dated 28th March, 1816. It contains an advertisement giving notice of a “Special General Assembly of the Proprietors of the Gosport and Forton Water-Works. . . . to consider the propriety of proceeding to effect an immediate sale and disposition of all the property and effects belonging to the Company. . ..” Little else is known of this Company. It was not in existence in 1808, because, as already recorded, the promoters of the old Portsmouth and Farlington Company in that year intended to include Gosport in its Area of Supply – a proposal that was soon dropped. On the other hand, there is in the records of the Portsmouth Company a letter dated November, 1811, referring to a pump “exactly the same as made for the Gosport Water- Works”. The inference appears to be that this Company had a short life, from about 1809 to 1816. The works were a well and pumping station at Forton, which were later purchased by the Government for the supply of the nearby Marine Barracks. According to the National Census of 1851, the population of the Parish of Alverstoke was 16,908 of which 7,414 were in Gosport Town, and 2,432 in Service and other establishments. Gosport, Forton and Anglesey Water Consumers’ Company Ltd. The next step to introduce a piped water supply was a local enterprise; it was inaugurated at a meeting held at the India Arms Hotel, Gosport, on 21st August, 1856, with Benjamin Hobbs senior of Forton in the Chair. It was resolved to form a Company to be called the “Gosport, Forton and Anglesey Pure Water Consumers’ Company”, with a Capital Stock of £25,000 in £10 shares. (The word “Pure” was afterwards dropped). The resolutions were supported by the signatures of 33 of the leading inhabitants. Rev. Edward Burney, school proprietor. to whom, at a later date, Joseph Starkey of London was added. Horatio Compigne, a partner of David Compigne, became the Secretary. Apparently no Chairman was appointed, each director in turn taking the Chair. An office was opened at the Town Hall and Market House on Gosport Hard, where on 6thSeptember a public meeting was held and subscriptions invited. The directors engaged James Pilbrow, civil engineer, of London to prepare plans and specifications for a complete scheme. His proposed source of supply was a well with a borehole in the bottom, to be sunk in the water-bearing strata known as the Bracklesham Beds and Bagshott Sands at Bury Cross, about a mile west of the Town, together with a pumping station and water tower, and about eight miles of distribution mains.On the basis of this scheme, a prospectus was issued in December, 1856, inviting subscriptions towards an initial capital of £25,000. It stated that a contractor named Murray was prepared to undertake the complete works for the sum of £23,000 and that, if he was awarded the contract, he was willing to subscribe one-fourth of the capital; the Company would in the first instance be established under the Limited Liability Act (which was a novelty, this Act having been passed only in the previous year), but an Act of Parliament would be applied for in the ensuing Session. Pilbrow, however, when he heard of Murray’s offer, informed the directors that his own estimate for the complete scheme was only £14,331, and advised that the work should be let in six separate contracts. Murray’s tender was therefore declined, and consequently his offer of financial assistance was lost. In the meantime applications for shares were coming in so slowly that the intention to go to Parliament forthwith had to be abandoned. In January, 1857, an amended prospectus based on a capital of £17,000 was issued, and in order to give local investors visual evidence that a scheme was definitely afoot, it was decided to seek tenders forthwith for sinking the well and borehole at Bury Cross. The contract was let in the following May, when the first sod for the new waterworks was cut.In view of increased support for the enterprise it was later decided to apply for the intended Act in the Parliamentary Session 1857-58. The Act was passed on IIth May, 1858, under which the provisional Company became a statutory water undertaking named the “Gosport Waterworks Company” with a capital of £17,000 in £10 shares; and with power to borrow on mortgage up to £4,000. The Area of Supply was “the whole of the Parish of Alverstoke, in the County of Hants, in which the town of Gosport is situate” (about 6 sq. miles), and power to carry out the Bury Cross Works was confirmed. The first directors nominated by the Act were the seven named above, of whom the Rev. Edward Burney became the first Chairman; he was to remain in office for 30 years. He was was part-proprietor with his brother Henry of the Gosport Royal Academy, a large boarding school chiefly for naval and military pupils. Horatio Compigne, solicitor, was confirmed as the first Secretary and held that position for 29 years. The Head Office of the Company remained at the Market House until 1890, when it was transferred to 1 High Street. In 19IO it was moved to Thornfield House, 4 High Street, which in 1955 became the Gosport Office of the present Company. The Bury Cross Works were completed in 1860, from which water was first supplied on 26th September of that year. The daily yield of the well proved to be about 300,000 gallons, which was ample for some years to come. The capacity of the original water tower, however, was found to be much too small, so that a second larger water tower holding about 72,000 gallons was completed in 1866. During the next 25 years, various works on the same site were carried out to meet the increasing demand. By 1892, altogether five wells and seven boreholes had been sunk. The fifth well was, in effect, a large underground storage tank, 40 feet in diameter and 100 feet deep. In 1874 additional pumping plant was installed in the existing engine house, and in 1883-84 a second pumping station was constructed over one of the other wells. Notwithstanding all these costly well works, the total daily yield was increased only from 300,000 up to 320,000 gallons, or by 7 per cent. Consequently, from about 1877 onwards, in order to conserve the supply, the water was normally turned off during the night hours. It is significant that all these wells had been sunk in the same geological formation as the well on Portsea Island belonging to one of the old Portsmouth Companies, who had likewise been unable to obtain an adequate large-scale supply from such a source. The Bury Cross wells were in due course superseded by other sources to be described below. They went finally out of use in 1907, except that during both the World Wars they were held in reserve as an emergency source of supply. After the continued failure to obtain more water from Bury Cross, the Company decided to develop new works at Foxbury Point, about three miles north of the Town and half-a-mile from the west shore of Portsmouth Harbour, and an Order authorizing the scheme was obtained in 1897. The source was a well sunk into the Chalk formation through the overlying clay beds, from the bottom of which headings (tunnels) were driven to tap the water in the Chalk fissures. The surface works consisted of a pumping station with two units, each having a daily capacity of about I million gallons, together with a large water tower holding 230,000 gallons; in addition a 15-inch trunk, reducing to 12-inch, was laid into Gosport. The sinking of the well itself was completed in May, 1896, and in view of the extreme shortage of water in Gosport, temporary pumping plant was provided to afford a preliminary supplementary supply; thus the first instalment of water from the new source started on 23rd August, 1896. The headings at the foot of the well and the pumping station were completed during the following winter and spring. On test the well was shown to have a daily yield of about It million gallons, which provided an ample reserve for future requirements. The water tower, however, was not finished until August, 1900, when for the first time for many years Gosport received a constant supply under good pressure. But it was to prove only a temporary blessing. Month after month the water became increasingly brackish; it was soon apparent that the normal Chalk water in the well was being contaminated by the infiltration of salt water from the Harbour. These conditions naturally provoked widespread complaints, reinforced by letters to the press and public protest meetings, as to the excessive hardness of the supply; it was also alleged to taste and to smell- the “Foxbury perfume” became a by-word. Unsuccessful attempts were made to cut off the fissures yielding the worst water, and to obtain better water by means of borings ; eventually, in 1903, it was decided that the well must be abandoned and a new source developed elsewhere. Altogether, the scheme had cost about £30,000, which had to be written off as a dead loss, apart from the pumping plant, which could be removed to another site, and the water tower which remained available to maintain the pressure of the supply. To provide a possible alternative to the Foxbury well, the Borough of Portsmouth Waterworks Company was approached in 1903 as to a supply “in bulk” from the Farlington reservoirs to Foxbury water tower, but this proposal was ultimately discarded in favour of a new well and pumping station at Mislingford in the Meon Valley, situated in the Parish of Soberton, about 11 miles north of Gosport. An Act for this purpose was obtained in 1904. The well was .sunk into the Chalk formation with a heading at the bottom, and the two pumping units for the new station were transferred from Foxbury. A I6-inch pumping main, about two miles long, was laid to a high-level service reservoir, holding 2,100,000 gallons, constructed at Gravel Hill, Shedfield, from which a Is-inch trunk gravitation main was laid through Fareham to join the existing 15-inch main previously laid from Foxbury into Gosport. The daily yield of the well was about 11/4 million gallons, and the station was brought into use on 24th May, 1907. Thus Gosport at last received a constant supply of good quality. The Bury Cross and Foxbury wells went out of use, and the Soberton Works, with various subsequent extensions, remained the sole source of supply for the next 34 years, until in 1941 they were supplemented by another source, to be described below. The main effect of the First World War (1914-18) was a rapid growth in the demand by the local Government Establishments, to meet which the yield of the well was increased in 1914-15 by extending the headings; and in 1918-19 the capacity of the station was amplified by a modification of the existing machinery and the installation of a “Worthington” pumping engine, for which the building was enlarged. After the War the average daily supply remained for a long period nearly steady at about 11/3 million gallons; to provide an alternative means of supply a second 15-inch gravitation main from the Shedfield Reservoir to Gosport was completed in 1933. But from 1935 onwards the forebodings of another war caused a further substantial growth of the Government supplies, so that a big development programme was put in hand. In 1937-38 a second pumping well was sunk at Soberton, and the headings were further extended, whereby the daily yield was increased up to about 2 million gallons; the station building was again enlarged to accommodate a “Uniflow” pumping engine, and in 1939 a second 16-inch pumping main laid from Soberton to the Shedfield Reservoir. In 1940, Shedfield Reservoir No.2 with a capacity of 3,500,000 gallons was completed; at Soberton, one of the old steam-driven pumps, originally transferred from Foxbury, was removed and replaced by electrically-driven plant, having a daily capacity of 3 million gallons. This was the first use of electricity for normal pumping purposes, the remaining steam-driven plant serving as standby. Under the Act of 1904 powers had been obtained to acquire the undertaking of the “Lee-on-the-Solent Waterworks Company Ltd.”, but the actual transfer did not take place until 1915. The purchase price was £5,280. Lee-on-the-Solent was first developed as a private building estate within the Gosport Area of Supply, but with its own waterworks constructed by the above-named Company, established in 1890. The works were in the High Street at the corner of Cambridge Road. The source was a shallow well, the water being pumped by oil-driven plant into a nearby water tower. Water was first supplied in 1897, and by the time of the transfer in 1915 about 3t miles of mains had been laid, the average daily supply being about 30,000 gallons to 200 properties. The local waterworks went subsequently out of use, the mains being connected to the Gosport distribution system. The threat of a Second World War and the War itself threw an unprecedented strain upon the Company’s water resources. By the end of the War the total demand was nearly 2 1/2 times larger than in 1935; the average daily supply had increased from under 1 1/2 million gallons to more than 31/2 million gallons. Most of this remarkable increase had come from the many Government Establishments in the Area, whose consumption rose to more than 4 1/2 times above that in 1935. Other supplies also increased substantially, and in addition much extra water had to be supplied on account of wastage caused by air-raid damage to mains and service pipes and by the lack of labour to deal with normal repairs. It became clear that, with the further extension of the headings at the Soberton Works in 1938, the probable maximum reliable daily yield of about 2 million gallons from that source had been reached; moreover, it was unwise in the event of war to rely wholly upon a single means of supply. In consequence an Act was obtained in 1940 to develop a new independent source at Hoe, about one mile south-east of Bishop’s Waltham. The initial works were carried out during 1940-41. They consisted of a deep well in the Chalk, with headings, the water being pumped by two electrically-driven units with a daily capacity of 1 and 2 million gallons respectively, housed in a temporary blast-proof building. A 15-inch pumping main, about two miles long, was laid to the Shedfield Reservoirs. After the War the smaller unit was replaced by another of 2 million gallons capacity, together with a stand-by oil-driven power unit, and a permanent building was erected. The daily yield of the well proved to be at least 11/2 million gallons. In addition to the Hoe Works various other War-precautions were taken. The Foxbury water tower was kept filled; an electrically-driven pump was installed at the Bury.Cross underground tank, and an oil-driven pump at the Lee-on-the-Solent well. The private wells at the Gosport Gas Works and at the Inverness Laundry were fitted up to provide a limited supply, and a fleet of mobile drinking water tanks was acquired. In addition, emergency connections were made between the Company’s mains and those of its neighbours – the Southampton Corporation and the Fareham Urban District Council. During the War Gosport shared with Portsmouth in the wide-spread damage to water mains caused by the many air raids. The worst experience occurred on the night of 10th/11th January, 1941. During the following three days the loss of water due to broken mains and service pipes and extra water used for fire-fighting was so large as to cause the two Shedfield Reservoirs, which together hold about 6 million gallons, to be nearly emptied. By good luck the essential parts of the new Hoe Works and the pumping main there from were at that time on the point of completion; an emergency effort to make the final connection brought the station into immediate use, thus obviating any curtailment of the supply. Throughout the War all the Company’s principal works fortunately escaped damage. The piped water supply to Bishop’s Waltham has had a varied history. It began in 1894 with the formation of the “Bishop’s Waltham Waterworks Company Ltd.”, the principal promoter of which was Charles Liddell Simpson, civil engineer, of London. The works consisted of a shallow well in the Chalk and pumping station situated in a dis-used chalk-pit at Northbrook, about half a-mile north of the Town, together with a service reservoir at Vernon Hill, a little further away, and holding about 183,000 gallons. In 1914 the Undertaking was acquired by the then South Hants Waterworks Company, but this in turn was purchased in 1921 by the Southampton Corporation. By the Gosport Act of 1940, the Bishop’s Waltham supply was in 1941 transferred to the Company, the purchase price being £11,170. As the original pumping plant had become obsolete, a connection was made in 1942, by which the greater part of Bishop’s Waltham was supplied from the Shedfield Reservoirs, and an existing small borehole at the Northbrook Works was brought into use, from which water was pumped by means of electrically driven plant to the Vernon Hill Reservoir for the supply to the higher parts of the locality. 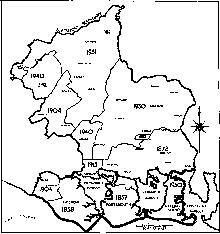 Up to 1904 the Company’s Area of Supply was confined to the then Gosport and Alverstoke Urban District, about six square miles. The first extension took place under its Act of 1904, by which were added the adjoining Parish of Crofton (since 1932, Crofton Ward in the Fareham Urban District), together with a separate Area to the north of Fareham, comprising the Parishes of Wickham, Shedfield and Swanmore, all in the Droxford Rural District, thus increasing the Area to 28 square miles. These Parishes were subsequently supplied from the first Shedfield Reservoir. A second extension was authorized by its Act of 1940, which added the Parishes of Boarhunt, Bishop’s Waltham and part of the Parish of Durley, all in the Droxford Rural District; this increased the Area to 38t square miles. With the exception of the higher parts of Bishop’s Waltham (supplied from Vernon Hill Reservoir) they were also supplied from the two Shedfield Reservoirs. A third extension was made under its Order of 1951, which added most of the remaining Meon Valley Parishes, namely, Corhampton, Droxford, Exton, Soberton, Warnford and West Meon, together with the Parish of Upham to the north of Bishop’s Waltham, all in the Droxford Rural District. Thus the Area of Supply became 77 square miles. At that time the only existing piped supply in these Parishes was at West Meon, where in 1939 the Droxford Rural District Council had introduced a supply to the village from a small borehole in the Chalk at Vinnell’s Lane with an electrically operated pumping station and reservoir. Under the Order this was transferred to the Company. One of the effects of the very rapid increase in demand during the War was to cause an excessive drop in the day-pressure of the supply in Gosport; it had also been necessary on occasion during droughty periods to impose restrictions on the use of water. At first it was thought that this situation would right itself after the War with a marked decrease in the requirements by Government Establishments and industrial users. In the outcome, however, these supplies fell off only to a slight extent; moreover, a substantial increase was to be expected due to large housing schemes being developed by the Borough Council and by the Fareham Urban District Council. In consequence, the Company decided on an extensive programme of new works, which was carried out in the period 1953-56. To safeguard the main supply a second electrically-driven pumping set with a daily capacity of 3 million gallons was installed at the Soberton Works, together with a diesel-driven power unit as standby. Consequently, the remaining steam driven pumping plant hitherto relegated to stand-by use, was finally superseded; it had pumped water to supply for the last time in 1952. The second old engine, transferred from Foxbury in 1907, and the “Worthington” engine were removed in 1953, and the “Uniflow” engine in 1957. Thus ended the use of steam, raised by coal-fired boilers as source of power at the Soberton Works. To improve and regulate the pressure in the Gosport area an intermediate service reservoir and water tower on the line of the gravitation mains from the Shedfield Reservoirs were constructed at Hoads Hill, about a mile south of Wickham; the reservoir has a capacity of about 2,000,000 gallons. An additional gravitation main (18-inch reducing to 15-inch) was laid there from into Gosport. A large borehole was sunk at the Northbrook Works, which proved to have a daily yield of about 1 million gallons. As this quantity was much in excess of local requirements, it was decided to use it for the main supply by laying a I5-inch pumping main therefrom to the Hoe Works, where, by a connection to the existing main, water could be delivered direct to the Shedfield Reservoirs. Since the local conditions seemed favourable to producing even more water, a second borehole was sunk, which proved to have a daily yield of 11/2 million gallons. The Northbrook Works thus became a valuable addition to the Company’s water resources. As to the extension of the rural supplies for the Parishes added by the Act of 1951, many parts were too high to be served from the existing Shedfield Reservoirs. For the supply to Upham a service reservoir holding 200,000 gallons was constructed at Street End on Stephen’s Castle Down, about two miles north of Bishop’s Waltham, water being boosted thereto from the Vernon Hill Reservoir. For the supply to the Meon Valley Parishes a service reservoir holding 200,000 gallons was constructed at Fir Down, about a mile north-west of Droxford, water being pumped thereto direct from the Soberton Works. In 1956-57 the existing supply to West Meon from the nearby independent works was safeguarded by the provision of a second borehole and pumping plant. The Company ceased to be an independent Undertaking in 1955, when it united with the Portsmouth Water Company. Average Total Daily Supply .. 3,604,000 galls. The principal events were:- The first supply from the Bury Cross Works (1860); the unfortunate Foxbury episode (1900-07); the opening .of the Soberton Works (1907); the very rapid increase in demand prior to and during the Second World War (1935-45); and the big programme of new works started in 1953 to meet the post-War conditions. In 1944 the Coalition Government of the day issued an important White Paper entitled “A National Water Policy”, in which emphasis was laid on the desirability of amalgamating the many separate water undertakings throughout the country into larger units. The foregoing pages show that in South-east Hampshire this evolutionary process was already at work. Over the years the Portsmouth Company had absorbed the Idsworth Estate Waterworks (1930), those of the Catherington Rural District Council (1931), and the Hayling Island supply of the Havant and Waterloo Urban District Council (1950); the Gosport Company acquired the Lee-on-the-Solent Waterworks: Company (1915), the Bishop’s waltham Waterworks of the Southampton Corporation (1941), and the West Meon Waterworks of the Droxford Rural District Council (1951). A momentous step was initiated in 1953, when a preliminary exchange of views between the directors of the two Companies indicated that both parties were favourable to an amalgamation. Terms were embodied in an agreement dated 28th April, 1954. which were later approved by the stockholders. The transaction was finally confirmed by a Ministerial Order which came into force on 1st April, 1955, thus creating the “Portsmouth and Gosport Water Company”, which became the sole Water supply Authority for almost the whole of South-east Hampshire. Average Total Daily Supply .. 19,409,000 galls. The Portsmouth Water Company was established as the Borough of Portsmouth Waterworks Company in 1857, and the Gosport Waterworks Company in 1858. But since the latter had actually begun the construction of its first Works at Bury Cross in 1857, it is justifiable to regard the two Companies, now united, as having attained their Centenary in the same year, 1957. Thus the final chapter of this History comes to an end at an appropriate and significant stage in the development of the Portsmouth and Gosport Water Supply. It is a record of a long sustained and worthwhile service to the local community, promoted by local private enterprise.